Tears have many functions. They serve to lubricate the eye as well as wash germs and other irritating substances from the eye surface. Additionally, the front surface of the eye receives oxygen from the tear film. Dry eye occurs when the eye does not produce tears properly (decreased tear production), or tears are not the correct consistency and/or evaporate too quickly (excessive tear evaporation). Eventually, rough spots appear on the eye surface, typically affecting vision quality and increasing the risk of eye infection. In severe situations, corneal scarring can occur. Dry eye naturally occurs with aging. It can also occur as a side effect from certain medicines (e.g., blood pressure, decongestants), in women undergoing hormonal changes, with particular medical conditions (e.g., rheumatoid arthritis, diabetes), or environmental conditions. There are 2 predominant forms of dry eye – aqueous and evaporative. Evaporative dry eye – affects 86% of sufferers. Caused by Meibomian gland dysfunction (MGD) or blocked glands that create a deficiency in the oil layer of the tear film. MGD is a chronic, progressive disease. 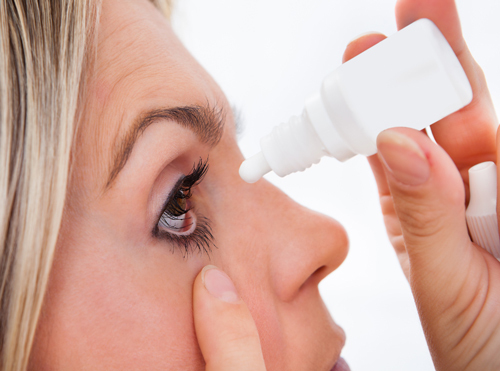 Aqueous dry eye – Your doctor can advise how to manage aqueous dry eye. Keeping lids clean – Lid hygiene is important to maintain correct bacterial balance and proper oil secretions. Adding moisture – Mild cases can be managed with over-the-counter artificial tear solutions. Heart of America stocks a selection of over-the-counter daytime and nighttime topical treatments such as tears or ointments for temporary relief of dry eye. Conserving tears – Tear ducts are blocked with tiny silicone plugs to keep natural tears on the eyes. Increasing tear production – Prescription eye drops are available that increase tear production by reducing inflammation. Treating ocular surface inflammation – Prescription eye drops or ointments, warm compresses, and lid massage are methods to decrease inflammation around the eye surface. Lipiflow® Thermal Pulsation System – Heart of America offers in-office Lipiflow therapy that treats evaporative dry eye by opening and clearing blocked glands. This permits the body to resume natural production of lipids (oils) needed for the part of the tear film that prevents evaporation. Our doctors can diagnose dry eye during a comprehensive eye exam. But we may not be able to fully understand the root problem without additional testing. LipiView is used to get an accurate digital picture of your tear film and blink quality. We might take a picture of your oil glands (meibomography), too. This is a non-invasive process that takes about 5 minutes. You look directly at a special light camera and blink normally while a computer program records your lipid content and quality. These images and data help our doctor to determine if meibomian gland dysfunction is the cause of your evaporative dry eye syndrome. Lipiflow® can help your dry eye symptoms by restoring meibomian (oil) gland function. It is the only FDA-cleared medical device shown to do so. It works by comfortably heating up the glands to 43 degrees Celsius with the LipiFlow® Activator, a cushioned device that rests on the eye. This temperature allows the inner glands to be warmed without damaging delicate eyelid skin. After the glands are sufficiently heated, a therapeutic massage helps unclog the blocked glands. The entire process lasts around 20 minutes. Luckily, after the glands are cleared, most patients feel some relief from dry eye symptoms. The doctors will prescribe long-term “homework” to perform to maximize a successful outcome. Patients typically need a repeat procedure every 1 to 3 years. Are you struggling with dry eyes? Let us help.